For awhile now we've had the sense that the time for retiring our venerable M.G. B-series 18V motor is near. The engine has served us well over the past three years, a couple of broken valves and countless gallons of burnt oil notwithstanding, but on a good day we can get at best 50 psi of oil pressure at the gauge, and that's if we squint and sort of avert our eyes. After a few miles on the freeway it drops lower. A lot lower. We bought ourselves a few extra pounds of pressure last year by reinstalling our old oil cooler, but that only delayed the inevitable. 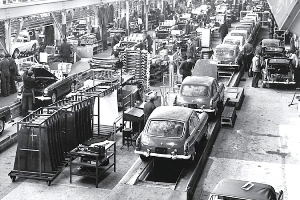 Back in 1978 we were faced with a similar rebuilding decision on our '67 MGB, although the symptoms of impending doom were different. The '67 engine was way down on power, compression was low, and you could hear the dreaded death rattle from the pistons any time you gave it more than half throttle. When we pulled the head, you could actually see the cylinders were out of round. We rebuilt that motor ourselves, except for the machine work, and it wasn't really a major challenge, although we did have to start with a new block, one with approximately round cylinders. The block on our Locost seems fine by comparison. Compression is decent and the car makes good power. 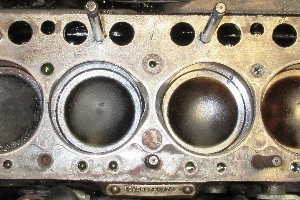 We've had the head off a couple of times and there aren't any noticeable gaps between the pistons and the cylinder walls. Still, the bearings are obviously shot and the oil control rings are no longer in control of anything. 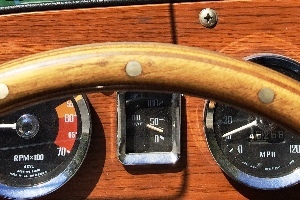 There's an old rule of thumb that says all you need is 10 psi of oil pressure for each 1000 RPMs, and we have that, but only barely, and it's an old rule. We don't expect things to improve on their own. Or even stay the same. We could keep driving the car and see what happens. We did that once with an old VW, ran it completely out of oil. We were on a long drive home, and for budgetary reasons were unable to stop and add more. So we just kept going, zipping along to the reassuring knock of the crankshaft, the car running for almost 50 miles like that, until a rod came through the crankcase just two miles from home. Walking distance. So that wasn't too bad, except we did have to junk the engine. Fortunately we had a spare in my parent's garage. We don't want to have to junk our M.G. engine. 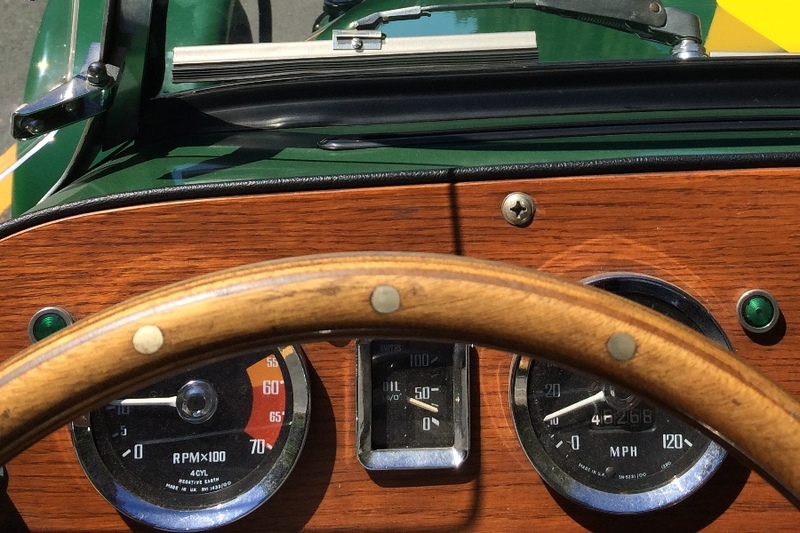 You can sill find plenty of worn-out MGB mills on Craigslist, but we've enjoyed almost thirty thousand miles with ours and we think it's solid. Some other engine, you never know. Could be fine, could be full of cracks. So we want to keep our engine, but we're also tired of adding oil every forty-five minutes. We have to do something, and we're pretty sure we have to do it soon. Besides the engine work, we've also been wondering when we're going to get around to making those frame repairs that we've been promising to do ever since our encounter with a concrete median strip last June. The only problem with these repairs is that they'll require significant deconstruction of the front end of the Locost, likely turning a fun day of welding into a really long weekend. Which is likely why we haven't done it yet. So that's two big jobs we've been facing for a while, and we thought we were doing a pretty good job of putting them both off. Ordinarily, as those of you who've followed our rants for the past couple of years know, we don't like doing anything that takes the Locost out of commission for more than a day or two. With all of the upcoming club drives and summer events we have planned for the car, neither of these jobs was looking very promising from a scheduling perspective, at least for the next couple of months. But then fate stepped in. We were cruising along the freeway early one evening, enjoying the ride and minding our own business, when the hood popped up and flew off the car. We were a little surprised, but this isn't a particularly unusual event for our Locost, and damage in the past has always been minimal. So we pulled off the freeway, hopped out of the car, and ran back to retrieve it. We spotted the hood sitting right side up in the number 2 lane, looking fat and happy and unscathed, and while we waited for traffic to clear so we could make a mad dash to collect it, a truck came along and crushed it flat. So we have to make a new hood. 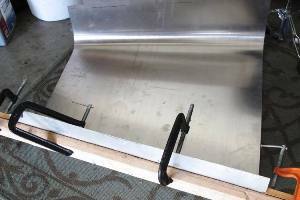 For some reason that's still unclear to us, we saved the original paper template for the hood, so we should be able to cut a new sheet of aluminum to the correct size. 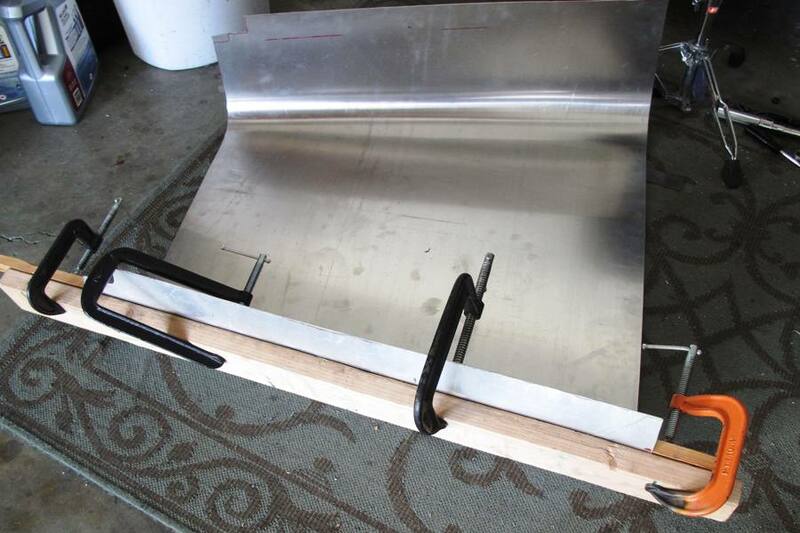 Unfortunately, something we learned when we made our first hood, you can't fold a sheet of aluminum into the shape of a hood with the engine in the car. It's too tall. So we need to pull the engine, and you can probably see where this is going. With the engine out, we might as well do it all. Dismantle the front of the car, weld up the frame, fold up a new hood, and rebuild the engine. A new hood gives us the chance to fix some of the problems we had with the old hood. And possibly create some new ones, but we'll focus on that later. For now we're only looking at 1) eliminating the hole for the old coolant filler, 2) using .040 aluminum instead of .050, and 3) getting rid of the ugly bump in the hood. Yes, that's right. Now that it's gone, we can be brutally honest. We never liked that bump. It was big and square and just looked bad. The new hood will have a hole for the valve cover, and that's it. Our only goal for the hood is that it stays on the car better than the old one did. We have three goals for the engine rebuild. Four, if you count getting it running again. The first will be to reduce oil usage. This should be easy, as few engines in the history of automotive engineering ever burned as much oil as ours does. Almost anything would be an improvement. The second goal is increased oil pressure, which will likely be a byproduct of reduced oil consumption, but you never know. We think we can accomplish both of these goals with just new bearings and piston rings, which can be replaced by pulling only the cylinder head and oil pan. The third goal�and we realize we're reaching here�is increased horsepower. 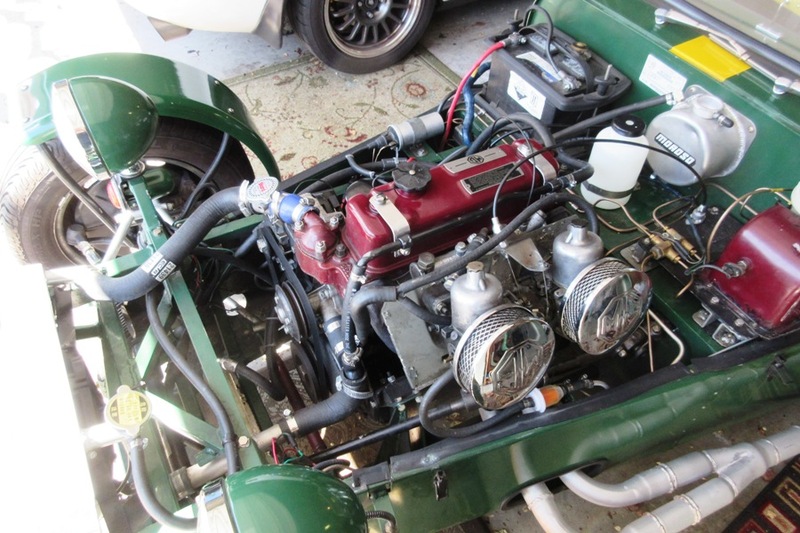 The original MGB 1800 engines had an 8.8:1 compression ratio, producing around 100 horsepower at the flywheel, adequate for a top-down roadster of the day. 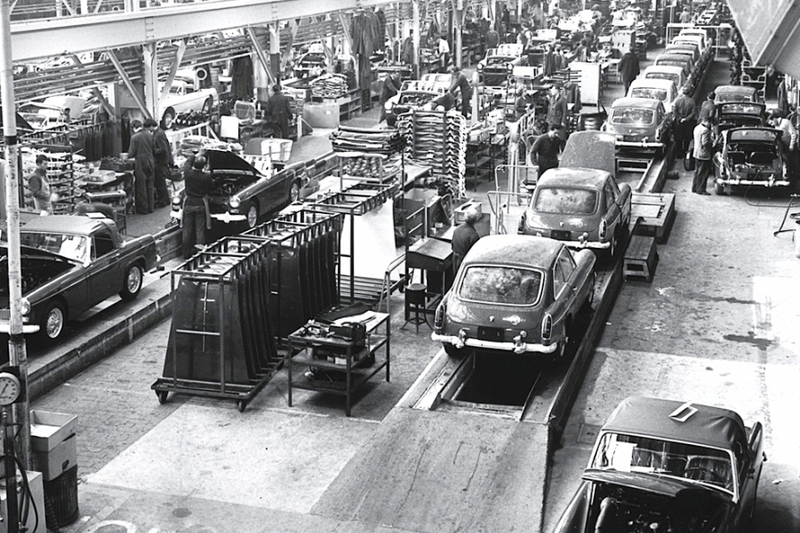 In 1972, the year of our donor, British Leyland began fitting deep-dish pistons to MGB engines, thereby lowering the compression ratio to a miserable 8:1. Similar changes were introduced up and down the Leyland line, the resulting anemic engine performance heralding the end of the classic British sports car. Also helping was the Datsun 240Z and Mazda RX-7. 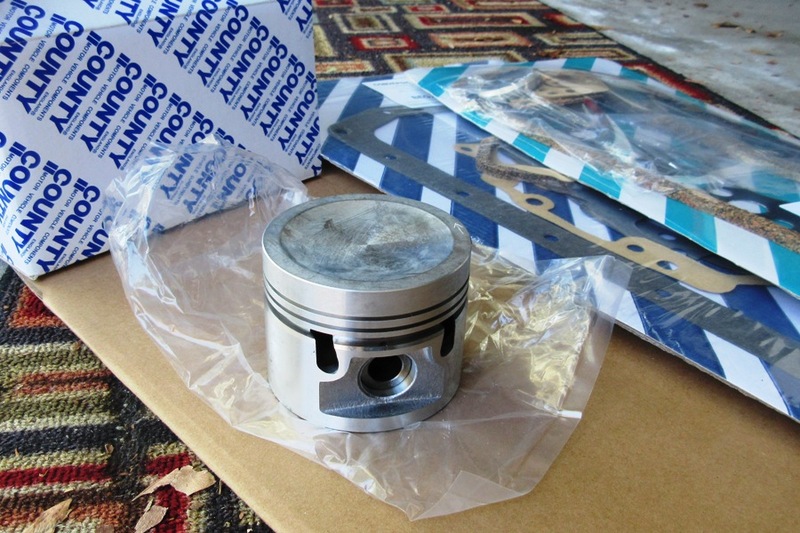 We figure as long as we're replacing the rings, with very little additional effort we can also replace the pistons. 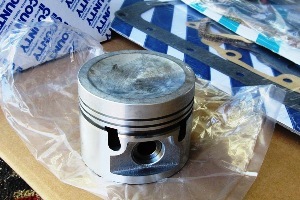 As luck would have it, you can still buy the early shallow-dish MGB pistons. You can also buy the later deep-dish pistons, but we're not sure who would do that. The early pistons, along with the reduced combustion chamber size of the later smog-equipped cylinder heads, should generate a compression ratio of around 9:1 or better, yielding close to 110 horsepower at the aforementioned flywheel. This is up from an estimated 80 now. Quite an increase. We're not 100% sure the engine is up to it. A lot will depend on how much wear the cylinders and crankshaft have seen. If we're less than three or four thousandths out of spec, we'll be okay. More than that and we could be wasting our time. Fortunately it's not a lot of time, and the engine runs pretty well now with whatever wear it's got. Plus, new pistons and bearings can't hurt. We think. Maybe the oil control rings have seized in the piston grooves. 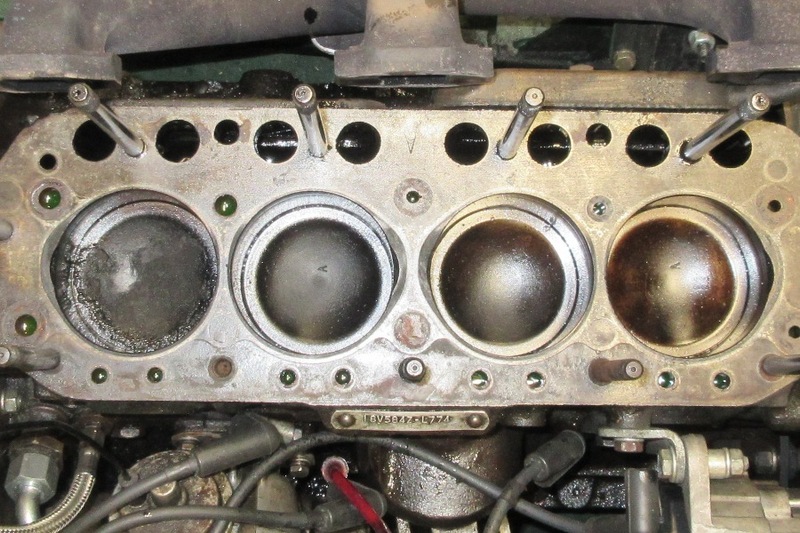 It's not uncommon in engines that have sat for a while. Just replacing those would make a huge difference. So we'll see. Experts might argue that merely replacing the bearings and pistons isn't an actual rebuild, and of course they're right, but three things. 1) A full rebuild would sideline the car for at least a month, 2) the cost would be prohibitive, and 3) the odds of us getting everything back together correctly would be greatly diminished. So we're doing a refresh, and we're not asking for much, just better oil pressure, increased performance, and making it from one fill-up to the next without adding oil. We think it's possible. Stranger things have happened. Although not many.